CSS Alabama , a 1050-ton screw steam sloop of war, was built at Birkenhead, England, for the Confederate Navy. After leaving England in the guise of a merchant ship, she rendezvoused at sea with supply ships, was outfitted as a combatant and placed in commission on 24 August 1862. 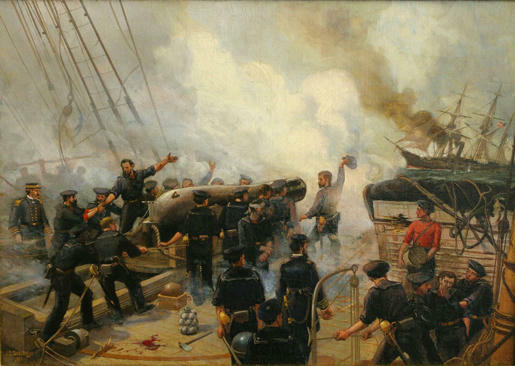 Commanded by Captain Raphael Semmes , Alabama cruised in the North Atlantic and West Indies during the rest of 1862, capturing over two-dozen Union merchant ships, of which all but a few were burned. Among those released was the mail steamer Ariel , taken off Cuba on 7 December with hundreds of passengers on board. Alabama began the new year by sinking USS Hatteras near Galveston, Texas, on 11 January 1863. She then moved into the South Atlantic, stopped at Cape Town in August, and went on to the East Indies, seizing nearly 40 more merchantmen during the year, destroying the majority and doing immense damage to the seaborne trade of the United States.